Adjustable Wrenches Are Designed For Various Mechanical, Industrial And Automotive Applications. Adjustable Wrenches come in a wide range of sizes, styles and jaw capacities to suit a variety of maintenance and repair applications. Knurled adjustable screw sets jaws to precise fit. Handle loop offers convenient toolboard storage when not in use. Some wrenches are spark resistant for safe use in hazardous work areas. Adjustable wrenches are offered from several trusted brand names including Global, C.S. Unitec, Eclipse, Ideal, Klein Tools, Proto, Stanley, Urrea and more. Size and jaw capacity vary per model. 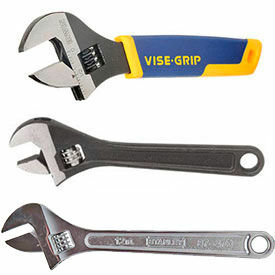 Adjustable Wrench Sets Are Designed To Easily Install and Remove Nuts, Screws, and Bolts For Various Residential, Repair, and Maintenance Applications. The wide jaws will support multiple sized fasteners making them useful for all job types. 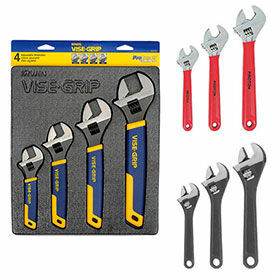 The steel construction makes these wrench sets tough and durable for years of lasting reliability. The wrench jaws are machined to increase the gripping strength for tight fastener control. The comfort grips help reduce hand fatigue during long work days. Colors and dimensions vary per model.